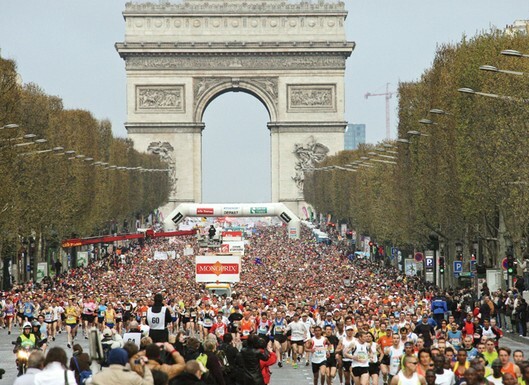 The Paris Marathon – what was I thinking? One reason is ego. I want to be one of those people that can saunter in to a conversation about running and drop in that they’ve done a marathon (a foreign one at that!). A marathon is one of those “great” achievements that, in actual fact, pretty much anyone can do if they really put their mind to it. Also, I’ve been to watch the last few London marathons and the atmosphere on each occasion has been fantastic and whilst it has been great cheering people on I want to be on the other side of the fence seeing what it’s like from that perspective. However, the main reason is that I’m putting myself through this is that I want to do some serious fundraising for KickStart Ghana, a charity I co-founded and help run. KickStart Ghana is a charity that aims to ensure that the people of the Volta Region, in Ghana, can fulfil their potential and have every opportunity to succeed. We focus on the promotion of education and sport to do this. We strongly believe that young people in Ghana should get the same opportunities as young people in the UK. Attending a school that doesn’t flood when it rains or being able to play in the local football team and pretend you’re the new Michael Essien. Small things that you and I would take for granted when growing up. The year leading up to May 2012 was our most successful year in terms on fundraising, we reached just over £18,000. Now in England that wouldn’t even pay for one teacher’s annual salary, but we were really pleased with our achievements in Ghana. Some of those included: extensive renovation work on a local school (the first since it opened almost 30 years ago), supporting a football club with five teams (four men’s and one women’s), providing a new water tank for a local children’s home to ensure a consistent supply of clean water and providing funds for new volleyball posts for a local school. We’ve also invested significantly in the local economy supporting our volunteers. Not bad eh? I want to make sure that KickStart Ghana can continue doing this work well in to the future. My fundraising target is a £1000. I (somehow) have 455 “friends” on Facebook and if they were to each donate £2 each I’d pretty much be there. So if you’re reading this and think “I can donate a few pounds” then I’d really appreciate it if you visited my Charity Giving webpage and did just that. If it is any help, I look nothing like a runner and I am also not a ‘natural’ when it comes to running, jogging or anything where you feet leave the ground for a sustained period of time. I am going to visit now and chuck a few quid your way. Thanks for the message and the donation as well, I really appreciate it. Appreciate the sentiments about not being a natural as well, good to hear I’m not the only one. NextAre volunteers really needed for the Champions League final?